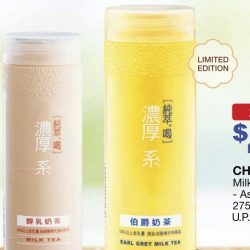 NEW Suo Yi Soy Milk Tea Is Now Available At Selected Cheers & FairPrice Xpress Stores! 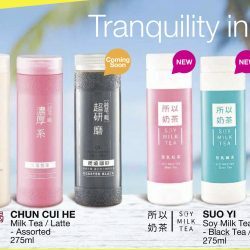 Abana Singapore, the company who brought you the super popular beverage from Taiwan, Chun Cui He 純萃喝。, has brought in another hot selling beverage - Suo Yi Milk Tea 所以奶茶! This drink will be perfect for those who are lactose intolerant with its soy milk formulation. This drink is said to be even more popular among the locals in Taiwan! Time to cool down in this sweltering weather with premium ice cream! 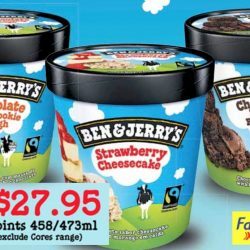 Ben & Jerry's ice-cream is now going at 3 for $27.95 (UP $13.90 each) at Cheers/FairPrice Xpress from now till 22 May 2017! While stocks last so hurry! Limited time only 純萃喝 Chun Cui He: Now Available at Cheers, FairPrice Express & Selected FairPrice Stores at 2 for $4.90! Make sure you're stocked up on your favourite 純萃喝 drink for the week. Now also available at your friendly Cheers, FairPrice Xpress and selected FairPrice stores! Get the milk tea or latte at 2 for $4.90 (UP $5.60) from now till 8 May 2017! Remember the earl grey milk tea is seasonal and available for a limited time only! While stocks last Cheers / FairPrice Xpress: Sanrio Characters Mini Alphabet Plushs Available for a Limited Time! 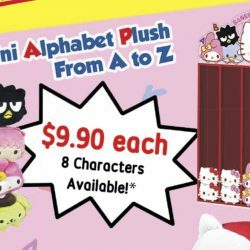 If you love Sanrio characters, these exclusive Sanrio Mini Alphabet Plushs are a must to grab at Cheers/FairPrice Xpress! Featuring Hello Kitty, My Melody, Gudetama, Pompompurin & Kiki & Lala, collect them all and they are also perfect as Christmas stocking fillers! Priced at $9.90 each. Available for a limited time only so get them now! 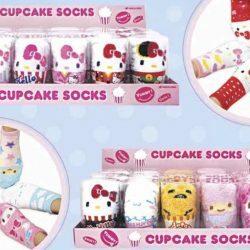 Till 31 Dec 2016 or while stocks last Cheers / FairPrice Xpress: Sanrio Characters Cupcake Socks Available for a Limited Time! If you love Sanrio characters, these exclusive Sanrio Cupcake Socks are a must to grab! Featuring Hello Kitty, My Melody, Gudetama, Pompompurin & Cinnamoroll, collect them all and they are also perfect as Christmas stocking fillers! Priced at $14.90 each. Available for a limited time only so get them now! Time for a dessert indulgence! 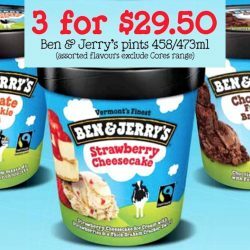 Exclusively at FairPrice Xpress and Cheers stores, get 3 Ben & Jerry's pints for only $29.50 (assorted flavours exclude Cores range). That's less than $10 per pint! Usual price is $13.90 for 1 pint. Products and variants availability vary from store to store till 24 October 2016, while stocks last. If you love Gudetama, Hello Kitty, My Melody, Badtz-Maru or Keroppi, dun miss the exclusive Sanrio Merchandise now available at selected Cheers & FairPrice Xpress stores! 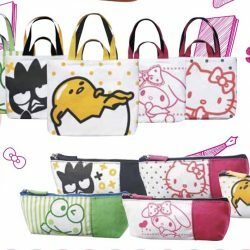 Get Sanrio school bags, tuition bags, pen pouches or water bottles for your children or yourself now! 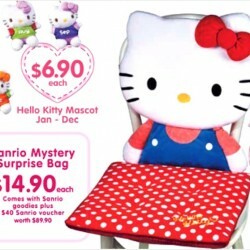 Till 30 May 2016 Cheers/FairPrice Express: Sanrio Collectibles – Hello Kitty Mascot, Car Seat Cushion & more! If you are a fan of Sanrio characters like Hello Kitty, Little Twin Stars and My Melody, head to Cheers or FairPrice Xpress stores for their new Sanrio Collectibles collection! Offers valid from 22 March till 30 May 2016. 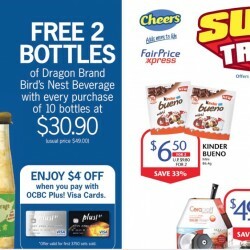 Dun miss the Exclusive Specials at Cheers and FairPrice Xpress! From now till 4 April 2016, get 2 free bottles of Dragon Brand Bird's Nest Beverage with every purchase of 10 bottles at $30.90 (Usual price $49.00). OCBC Plus! Visa Cardmembers enjoy a further $4 discount, valid for the first 3750 sets sold. Also enjoy savings up to 45% on Kinder Bueno, Snapple and Ceracraft woks!